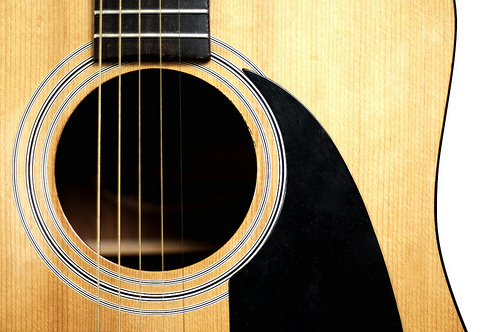 Music Costs > How Much Does an Acoustic Guitar Cost? The acoustic guitar is perhaps the most versatile and common guitar type since it is perfect for a beginner or intermediate player. Acoustic guitars are preferred over electric guitars for few reasons, mostly in relation to the kind of melody it is capable of producing. The best seller on Amazon.com, for example, includes 38-inch black guitar, guitar pick, pitch pipe, extra strings and a replacement strap. Nylon string acoustic guitars with an hourglass-shaped body can cost about $100 to $500 for a beginner’s guitar and close to $3,000 or more for a professional model. A steel string guitar, similar to a classical model, will often have a narrower neck with a flat back. These guitars are often found in folk or blues bands. These guitars can cost about $600 to $2,000 for a quality brand. Lastly, a 12-string guitar, which has strings strung closer together, being able to play as a single string, can start at about $150 and cost up to $1,500 for a better quality model. Guitaringenuity.com says the cheapest guitar they know of is a cheap $29, while the most expensive acoustic guitar ever sold was Eric Clapton’s C.F. Martin & Co for $791,500. Depending on the brand, the guitar may include extra strings, a pickguard, a pick, a sling, and a nylon gig bag. Be sure to check the box and/or product description to see what’s going to be included. A guitar starter pack, designed for beginners, may include guitar itself, books and/or a CD/DVD set to help you learn how to play. The thickness and width of the guitar will vary, and this will depend on the guitar body size. Necks will either be listed as a 12 or 14-fret, and this number refers to the number of frets above the guitar’s body, not the total number. Acoustic guitars can be made from a solid wood, such as cedar, cocobolo, ebony, granadillo, koa, mahogany, maple, ovangkol, rosewood, sapele, spruce and walnut. It can also be made from laminate, which will be composed of several layers. Laminate tops won’t vibrate as well as solid wood, so the sound may not be as rich. Concert and Grand – Smaller in size, these guitars are known to offer a bright sound and are designed for smaller musicians. Auditorium and Grand – Known as a mid-sized guitar, this is similar to the dreadnought mentioned below, but it will have a smaller waist. Dreadnought – This is a common type that is known for its square bouts and 14-fret necks. Jumbo – Considered the “cowboy” guitar, the lower bout can be up to 17 inches and play a much deeper sound. Travel – These mini guitars are about 25 smaller than a standard guitar, and it will have 18 to 20 frets. These guitars will have a narrow body slightly larger than the neck’s width. A high-quality guitar case, often not included, can cost anywhere from as little as $15 for a padded case to as much as $200 for a hardshell. It’s also best to carry around an extra case of strings. These strings can start at $5 and go up from there, depending on the brand. Learning the art of a guitar can be a complex process. Because of this, there are many DVDs and CDs available on the market that can help you learn the guitar. These learning materials can start at $5 and go up from there. To provide higher sound, an amplifier will be required. Amps can start at $45. Guitar picks can cost about $2 to $5 for a pack of 12. A tuner will be necessary to make sure that your guitar is tuned before it’s played. Repairs may be necessary for the future. For example, an acoustic guitar bridge repair can cost $100 to $200, while acoustic guitar crack repair can cost about $30 per inch. Other repairs may include replacing worn frets, a bowed neck, replacing tuners or leveling frets. Some of the pricier repairs, such as a neck reset, can start at $300. Some players opt to hire a professional to have their guitar setup. This will include adjusting the neck, performing minor fret work, tightening the screws and lubricating. This setup can cost about $75 to $110. Due to its size, some private sellers or retailers may charge for shipping. If the guitar is shipped in a case, it can cost $50 to $100. When shopping, always make sure you try the model before you buy. Even if you don’t play a lot, see how it feels and if you’re comfortable with it. If you have been playing for a long time, you should be able to find a guitar that suits your needs just by picking it up. It’s recommended children play a half-size guitar instead of a full-sized version, and parents should stick to a $100 to $200 budget as most guitars in this price range are suitable for a beginner. Acoustic guitars have a variety of body shapes and sizes. From a smaller size to an oversized body, these sounds can determine the sound projection and tones. With the body, make sure that it’s something you’re comfortable with. Do you plan on playing in a large venue or in front of people? What kind of electronics does the guitar include? Many systems can include preamps mounted on the guitar or a mount inside of the soundhole. Aside from the wood, also look at the wood finish. Different finishes can affect the way the wood vibrates. While the size is key, don’t forget to the look the length and width of the neck. The neck will be based on the overall size of the body. Most acoustic guitars will include a 12-fret or 14-fret. The choice of wood can help determine the overall sound of the guitar. Note that different sounds are going to produce different tones. The most common type of wood on the market today is Spruce. Watch out for the sales or promotions at your local music studio or retailer. Look for package deals by purchasing acoustic guitars that include important accessories. Look on eBay or Craigslist for second-hand acoustic guitars. Oftentimes, players will upgrade and will provide you with all of their equipment at a low price. If you do purchase used, however, be sure to pay close attention to the gaps, blemishes or scratches. If you’re just starting out, consider renting one. Most music shops charge about $20 to $30 per month.